The official geographic coordinates of Greece (latitude and longitude) are 39 00 N, 22 00 E. Greece is considered to be part of Southern Europe; it is also included as a Western European nation and part of the Baltics as well. It has served as a crossroads between many cultures for thousands of years. You may also want to find out how far away Greece is from various countries, wars, and conflicts. Greece has a total area of 131,940 square kilometers or about 50,502 square miles. This includes 1,140 square kilometers of water and 130,800 square kilometers of land. How long is the coastline of Greece? Including its island coasts, the coastline of Greece is officially given as 13,676 kilometers, which would be approximately 8,498 miles. Other sources state it to be 15,147 kilometers or about 9,411 miles. What is the population of Greece? These statistics are from the General Secretariat of the National Statistical Service of Greece, where they have MANY other interesting statistics on Greece. In 2008, there was a mid-year population estimate of 11,237,068. More official numbers from the 2011 census of Greece. 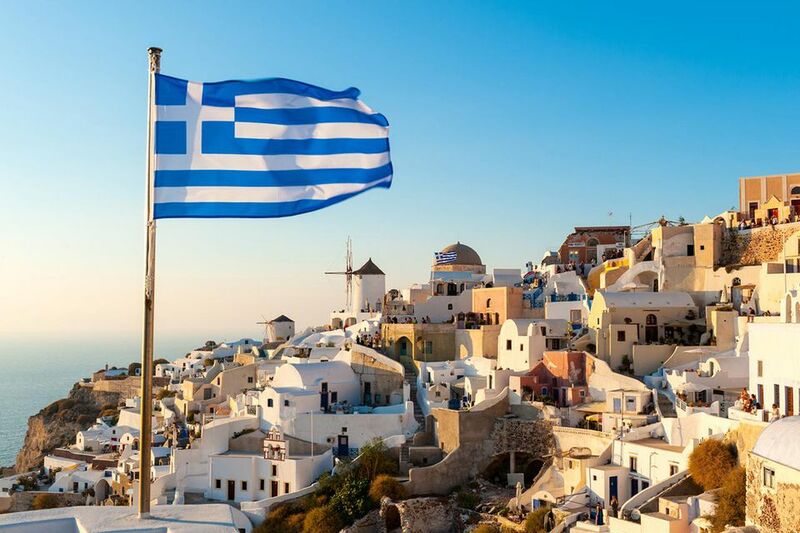 What is the flag of Greece? The Greek flag is blue and white, with an equal-armed cross in the upper corner and nine alternating blue and white stripes. Here is a Picture of the Greek Flag and information and lyrics for the Greek National Anthem. What is the average life expectancy in Greece? The average Greek enjoys a long life expectancy; in most lists of countries with the longest life expectancy Greece comes in at 19 or 20 out of about 190 counted countries. The islands of Ikaria and Crete both have many active, very elderly residents; Crete was the island studied for the impact of the "Mediterranean Diet" which some believe is one of the healthiest in the world. A still-high rate of smoking in Greece brings down the potential life expectancy considerably. Local short form in Greek: Ελλάς or Ελλάδα. What currency is used in Greece? The Euro is the currency of Greece since 2002. Before that, it was the drachma. What kind of government system is there in Greece? The Greek government is a parliamentary republic. Under this system, the Prime Minister is the most powerful individual, with the President holding less direct power. See The Leaders of Greece. The two largest political parties in Greece have been PASOK and New Democracy (ND). With the elections in May and June 2012, SYRIZA, also known as Coalition of the Left, is now a strong second to New Democracy, the party which won the June elections. The far-right Golden Dawn party is continuing to win seats and is presently the third-largest political party in Greece. Is Greece part of the European Union? Greece joined the European Economic Community, the predecessor of the EU, in 1981. Greece became a member of the European Union in January 1999, and met the requirements to become a member of the European Monetary Union, using the Euro as currency, in 2001. The Euro went into circulation in Greece in 2002, replacing the drachma. The counts vary. There are about 140 inhabited islands in Greece, but if you count every rocky outcrop, the total surges to about 3,000. What is the largest Greek Island? The biggest Greek island is Crete, followed by the lesser-known island of Evvia or Euboia. Here is a list of the 20 Largest Islands in Greece with their sizes in square kilometers. What are the regions of Greece? However, these do not correspond exactly to the areas and groupings that travelers will encounter as they move through Greece. Other Greek island groups include the Dodecanese islands, the Cycladic islands, and the Sporades islands. What's the highest point in Greece? The highest point in Greece is Mount Olympus at 2917 meters, 9570 feet. It's the legendary home of Zeus and the other Olympian gods and goddesses.The highest point on a Greek island is Mount Ida or Psiloritis on the Greek island of Crete, at 2456 meters, 8058 feet.